You are currently browsing the daily archive for August 4, 2011. One of the most significant omissions on the part of those bearing witness against the Sri Lankan government is detail about the manner in which the LTTE used the No Fire Zones. Though both the Darusman Report and the book by Gordon Weiss mention that the LTTE used military equipment ‘in the proximity of civilians’, they treat this as a distinct issue from the allegations they make against the Sri Lankan government. Given that returning hostile fire is not a war crime, they should have discussed the actual actions taken by the government in the context of proportionality, but this is avoided. The impression they seek to create is that the government attacked hospitals and civilians systematically, whereas the evidence, when it can be quantified – as with actual hits on hospitals, including within hospital premises – suggests that such incidents were extremely rare. Given the systematic manner in which the LTTE used civilians and places of civilian gathering, including hospitals, the record shows remarkable care on the part of the government. In reference to your different letters on the above mentioned matter (dated 16.02,. 17.02, 18.02 and 19.02 2009) the International Committee of the Red Cross wishes to inform you of the following. The ICRC is aware the Sri Lankan authorities have announced the demarcation of a new “safe zone” along the Mullaitivu lagoon, and welcomes this development as it may help to find practical humanitarian solutions that may enhance the protection of civilians and those no longer directly taking part in the hostilities in the Wanni. However, the ICRC would like to point out that not having been agreed upon by both parties to the conflict with the aim to shelter the wounded, sick and civilians from the effects of hostilities or with the aim to demilitarize it, the zone as such is not specifically protected under International Humanitarian Law (IHL). This being said, the civilians and those no longer taking a direct part in the hostilities who have taken in the ‘no fire zone’ remain of course protected persons under IHL. The ICRC has in the past not missed any opportunity, and will continue to do so, to remind both parties to the conflict to respect in all circumstances their obligations under IHL, in particular the principles of precautions, distinction and proportionality, in order to spare all protected persons from the effects of hostilities. That last line seems typical of the ICRC, and one wonders whether it was as helpful to the LTTE. 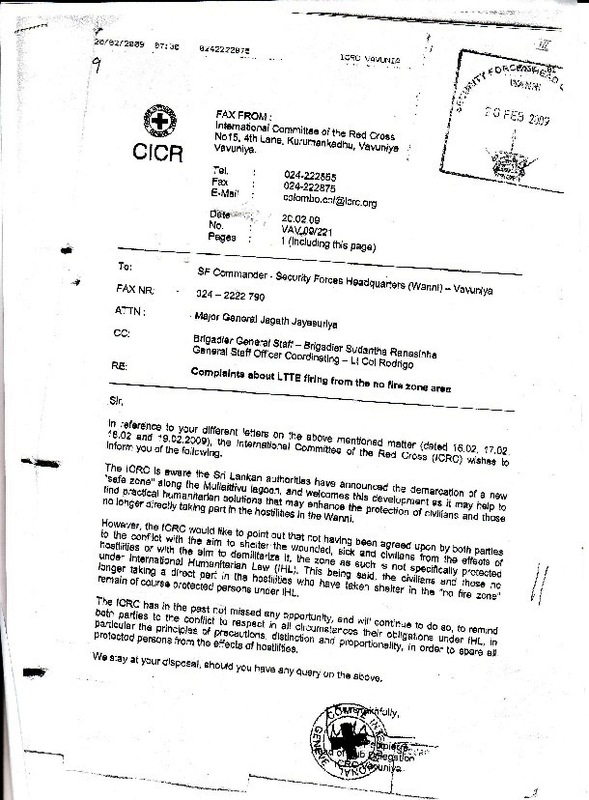 Of course one has to recognize that the ICRC worked on the basis of confidentiality, and they could not be expected to make public what advice they gave to the LTTE. Still, one can understand, particularly in the context of the deceit practiced by Jacques de Maio, who headed the Sri Lanka desk in Geneva, the anger of the Sri Lankan government at what seemed deliberately aggressive critical statements of the ICRC during the first couple of months of 2009, with specifics that seemed designed to present the Sri Lankan government in the worst possible light, with no matching criticism of the LTTE. The fact that the LTTE was deploying its weapons in close proximity to hospitals was never mentioned.